We know how essential is to network for any career developments. For the nonprofit sector engagement is not just about networking and it is not just about careers. It is about establishing sustainable initiatives, innovative solutions, and socially impactful programs. We would not be able to do so without the support, collaboration and cross-sector leadership of many stakeholders who share the same concern to ‘change the world‘ and support ‘inclusive communities‘. The MNA Program, in addition to career related events and connections with key leaders and alumni, offers the opportunity to ‘get your foot on the door’ of key organizations and fields. 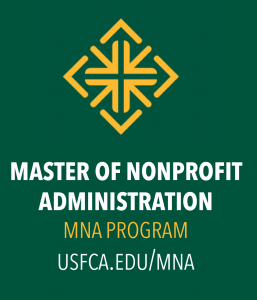 The MNA program does so through curricula embedded practical activities consulting with nonprofit organizations and social enterprises who shared the same passion for better organizations and societies. It does so also through co-curricula activities like the many conferences, events and connections that the San Francisco and Bay Area provides. The complexity of social problems require integrated solutions implemented by social change leaders equipped with the right tools for engaging across sectors, nations and diverse perspectives. Our values for human dignity, quality of life and community sustainability reflect also our competencies and connections with the social sector. The following is a partial list of preferred organizations and initiatives we often refer to in our programs and we hope they can be useful to you to further your engagement. Professional association for fundraising executives offering continuing professional education, career development, a mentoring program, a newsletter, and Fund Raising Days. Development Executives Roundtable (DER) is an educational and collegial resource for Bay Area fundraisers – professional, volunteer, and potentials alike – for over 35 years. Lunchtime meetings held on the second Friday of every month (with rare exceptions). Since its inception in 1998, GPA has grown rapidly. With over 1,800 current members internationally, the opportunities and benefits of membership continue to attract people from all over the globe. HBS Community Partners offers Bay Area nonprofits the opportunity to have pro bono consulting and advisory services by Harvard Business School alumni who wish to channel their business management skills to create positive social impact. Net Impact’s Service Corps volunteers partner with nonprofits on short-term, part-time consulting projects related to finance, marketing, new program development, business planning, fundraising, and strategic planning. 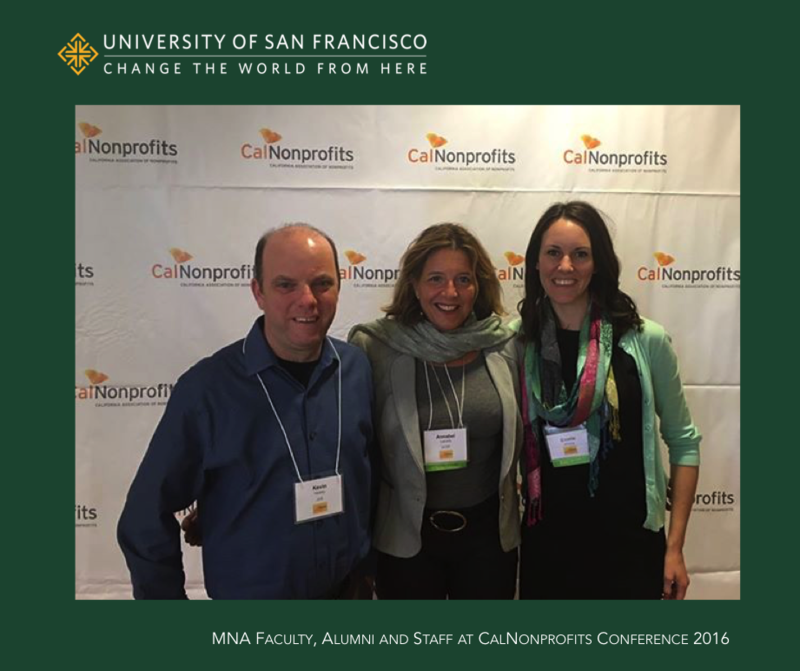 Northern California Grantmakers (NCG) is an association of foundations, corporate contributions programs and other private grantmakers. NCG’s work is focused in two broad arenas: enhancing the effectiveness of philanthropy, and strengthening the ties between philanthropy and it many stakeholders in nonprofit organizations, government, business, media, academia, and the public at large. The Young Nonprofit Professionals Network-San Francisco Bay Area (YNPN-sfba) promotes an efficient, viable, and inclusive nonprofit sector that supports the growth, learning, and development of young professionals. Web site provides a directory of consultants. The Center for Nonprofit Management offers seminars on issues related to nonprofit management. CompassPoint Nonprofit Services is a nonprofit consulting and training organization. They provide nonprofits with the management tools and concepts necessary to best serve their communities. iReuse is a service in the Bay Area helping nonprofits, schools, and other organizations get the stuff they need. All you need to do is create your wish list on iReuse’s web siteand get automatically matched up with local businesses and residents who are donating items which meet your needs. Mary’s List was created by Mary Gregory, a program officer at Pacific Foundation Services, as a way for non-profits to connect with qualified consultants and for consultants to connect with each other. The mission of the Impact Foundry is to enhance the resources and improve the management of nonprofit organizations, primarily within California’s northern Central Valley and Sierra Nevada regions. The Taproot Foundation is a leading nonprofit marketing and technology consulting firm. The foundation’s work is offered pro bono in a competitive grantmaking process. The Volunteer Center operates with the mission of linking people who care with people in need. Volunteer Center serves as a clearinghouse of volunteer information for San Francisco nonprofit organizations, individuals, city agencies, and other civic groups. Service organization which provides lawyer referrals, dispute resolution services, educational programs, publications and a resource library to artists of all disciplines and arts organizations. The Community Organization Representation Project (CORP) is a project of the Justice & Diversity Center of The Bar Association of San Francisco (formerly Volunteer Legal Services Program). They provide pro bono legal assistance to nonprofit organizations that directly serve low-income and underserved communities in Northern California. CORP can help with a variety of legal matters such as employment, corporate, contract, real estate, tax, and intellectual property. The Arts Loan Fund (ALF), managed by Northern California Grantmakers, has loaned over $19 million in the past thirty years as a way to boost the sustainability and growth of non-profit art and cultural organizations. Silicon Valley Community Foundation provides free community meeting space for nonprofit organizations located in San Mateo and Santa Clara counties. Organizations can use the state-of-the art facilities to host meetings, trainings, informal gatherings or retreats. The Center for Reuniting Families (CRF) at Dancing Deer Farm is a nonprofit education center and organic farm on California’s central coast. CRF provides a venue, at no cost on weekdays, to other nonprofits with goals and mandates compatible with theirs. Hub spaces range from stimulating, collision-rich café and hot-desking environments that support innovation, to quiet areas that foster focused concentration, to places where members work the phones for hours pushing their ideas forward. Hubs also feature event spaces for large and small film screenings, art openings, and presentations. The Marin Community Foundation (MCF) Loan Fund provides financing options to nonprofits that may not be able to access or afford traditional commercial debt. Metta Fund works with communities to improve health for all in San Francisco. Metta Fund offers their community room as a free resource to local nonprofits. The room accommodates up to 40 people and is available weekdays 8:00 am-5:30 pm. Miramar Farms provides a venue space for tech companies, and for non-profits as well, including donating our space to four nonprofits a year. The Nonprofit Finance Fund (NFF) provides loans, workshops, and planning assistance to help nonprofit organizations grow and thrive as businesses while honoring their mission. The Northern California Community Loan Fund (NCCLF) is a nonprofit lender dedicated to strengthening the economic base of low-income communities in northern California. Rebuilding Together San Francisco provides free renovations for San Francisco based nonprofits and community service facilities, as part of its Rebuilding Weekend program on the last weekend of April. Rebuilding Together San Francisco is a nonprofit organization that brings together volunteer teams to provide repair and renovation work for low-income homeowners, non-profits, and community centers. The type of work completed includes (but is not limited to): interior painting, minor plumbing, electrical, landscaping, carpentry, safety modifications, etc. Offers the following graduate degrees: Master of Public Policy (MPP), Master of Business Administration (MBA) with option of concentration in nonprofit management, Joint MPP/MBA, and Joint MBA/MA in Educational Leadership. All graduate programs at Mills are co-ed. An online directory of scholarship opportunities and financial aid for California students. Offers a Masters in Public Administration with a concentration in Nonprofit Management and, in conjunction with the College of Extended Learning, a basic certificate in Nonprofit Management and a certificate in Nonprofit Leadership & Strategic Management. Offers a Public Management Program. MBA Nonprofit and Public Management Program. TechSoup Global helps nonprofits globally get and use technology to heighten their impact. Through its web sites, events, and community-building initiatives, TechSoup Global also helps companies and foundations optimize their philanthropic impact. Provides job postings for foundations, grantmaking public charities, corporate grantmakers, and other nonprofit organizations. Job postings cover the nation with many from California. BACC offers counseling, coaching, workshops, networking events, and job clubs. Currently open by appointment only. Provides job postings for nonprofits in the Bay Area and in other metropolitan areas as well. Posts job and intership listings on national and international basis. Provides job training programs, job placement assistance, job retention services, career and employment counseling, a Technology Access Center to utilize computers and office equipment, career-related workshops, and computer workshops and classes. Also offers online job listings, resume posting, and online job matching. Recent job openings announced by member grantmakers, and updated monthly. Carries extensive nonprofit job listings for administrative, staff and professional positions on a local and national level. This searchable databases allows for easy access to Bay Area job postings. Artists House Music is a nonprofit web site where all musicians can receive informational support, guidance, and expert resources to help them navigate the challenges and maximize the opportunities available to them within the music industry. Provides fiscal sponsorship to independent artists/producers who meet their requirements. Helps independent local groups develop their own arts programs. Promotes employment of artists and those skilled in crafts in the public and private sector. Provides for exhibition of artworks in public buildings throughout California; and enlists the aid of all state agencies in the task of ensuring the fullest expression of our artistic potential. Established through a combination of City and State legislation, and approved by the City’s Board of Supervisors, Grants for the Arts has a policy of supporting an arts organization’s general operating expenses. Its foremost goal is to be a stable, dependable base of support for organizations that continue to meet the funding criteria. City agency that champions the arts in San Francisco. The Film Society brings together international and Bay Area filmgoers and filmmakers through engaged and responsive audience interaction, creating a positive impact on the city’s community and cultural life. Theatre Bay Area’s (TBA) mission is to unite, strengthen and promote theatre in the region by providing communication networks and opportunities and creating resources for theatre companies, theatre workers, and theatre lovers. TBA serves as a liaison between the theatre community and government, business and others who benefit from a healthy and thriving theatre community.